Yes, the work continues as we dodge the squalls, rain, sun and wind. We managed to complete the long-planned painting project for the cockpit. It’s really a trial run to see what the results would be like. We are quite pleased with the results. The prep, as always, is the longest part. Prep is the key though as one knows that should there be any flaws in the surface they will show up tenfold in the end result. So attention to detail, cleanliness, taping and weather are key. 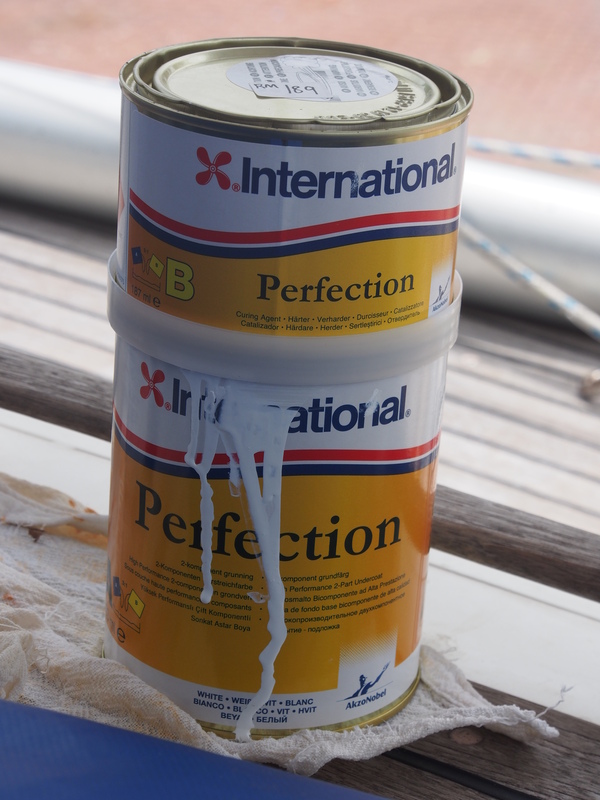 International Protection is a two-part polyurethane that is long-lasting, tough and difficult to apply. According to the directions ideal conditions are 16 degrees C and 70% humidity. Harumph, we are just not in the kind of climate that is conducive to using this product but we plod on. We have now taken off the blue tape and can sit in the cockpit proud of the end result despite all the challenges. Would we use this paint again? Time will tell. If it holds up well under heavy use the answer would probably be yes. It is difficult to apply but once one has the technique down for ‘rolling and tipping’ it’s actually satisfying to see such a good result. Yes, we should pat ourselves on our backs. I guess now though we have to put up with the two-tone nature of the colour in the cockpit with the contrast between the old gelcoat and the new paint. We are not doing the entire interior but rather a small amount at a time. 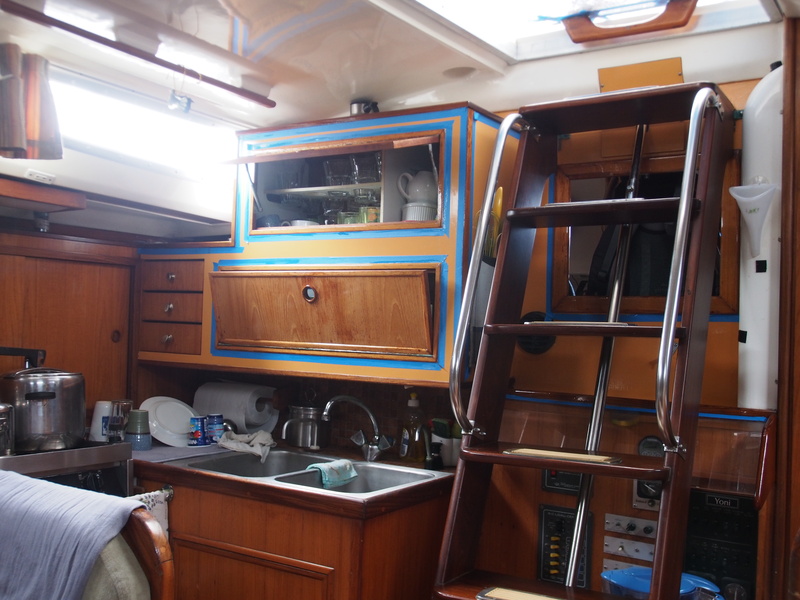 We are painting over some of the teak plywood as salt and sun damage has done its job in taking the life out of the ply. We like the choice of colour for painting over the ply and are highlighting the trim with a gloss varnish which provides a nice contrast to the painted surfaces. If we like this we will continue to follow through slowly in other parts of the boat. 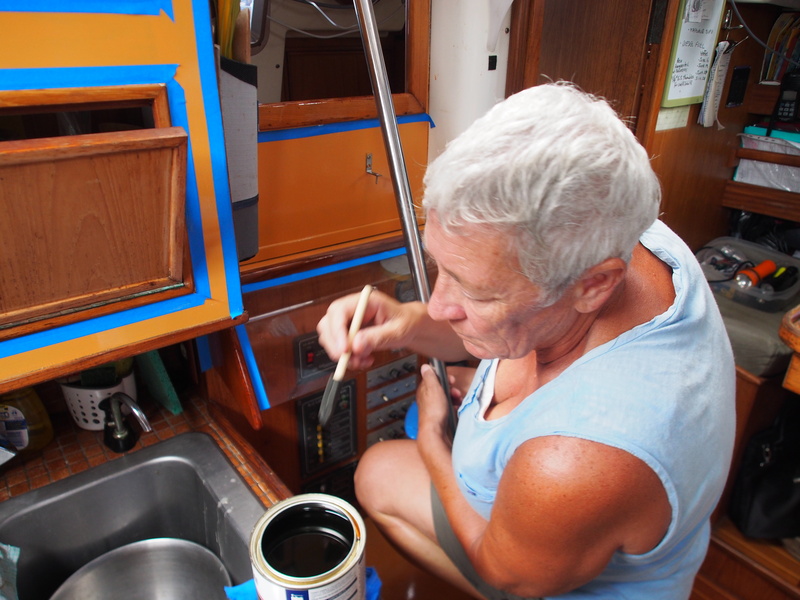 Connie is tuning up her expertise on the foam brush varnishing. We have tricked the weather in terms of varnishing by turning on the air conditioning. Not only does this make Connie happier in the varnishing trade but it does wonders in helping the varnish set up properly. 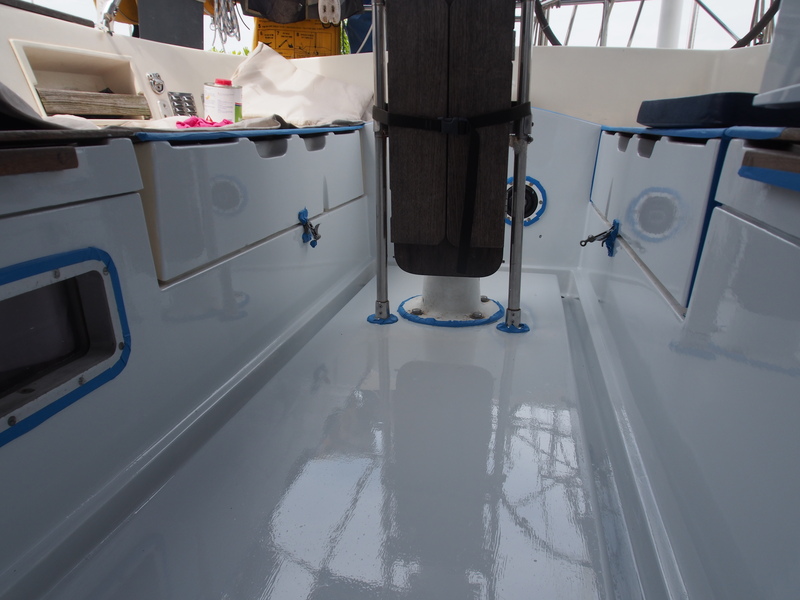 Lots of people have mentioned the problems in the tropical conditions of getting the varnish to set up hard enough in a reasonable amount of time. The air conditioner works wonders! So how much will we complete? The galley is a good start as the main hatch is the culprit in this area not only allowing the sun to do its damage but it’s also an area in which the occasional salt water wave comes pouring down. The combination of the salt water and sun over time has done a good job in keeping us employed in the maintenance world. Last but the reason we hauled out in the first place. The centreboard. Yes, more work in the centreboard. In planning for the re-installation of the centreboard I took a closer look at some of the fitting and decided to replace one. 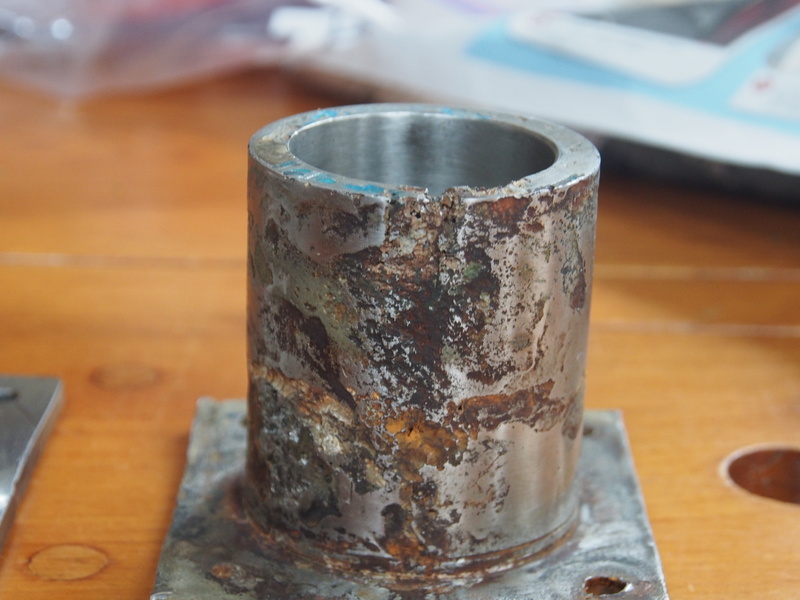 After 30 years in the water the SS flanged pipe that fits into the head of the centreboard was looking in poor shape. Was lucky enough to get a new one made up here and when the board goes back in I will be able to sleep at night not thinking about the possibility of the SS fitting letting go and having to do this work all over again. You can see the damage in the picture here. I have to say it’s not bad for 30 years in the water but it’s definitely not something one wants to continue sailing with. The replacement SS centreboard shaft, flange and end fittings. Limit the worry! is inserted from the port side, through the hull and the head of the centreboard to the starboard side where it is held by a bolt threaded into the end of the SS rod. Voila, finished. 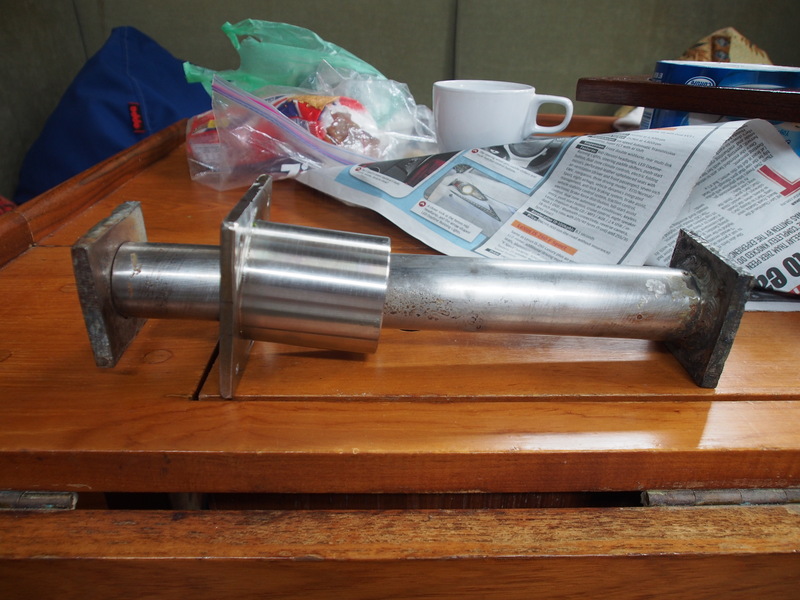 I am not yet at the installation point as still working on the finishing of the centreboard. Hope to have that finished in a couple of days and then install and back in the water by Friday if all goes well. That’s if for this weekend. You’ve got the paint on without kicking the can over! Believe me, I know about these things. Looks amazing, you two. Congrats!! Saw the Athena chugging by the other day (the biggest private sailboat in the world…). Aren’t you glad you’re not maintaining her? Bravo for everything you are doing!! !